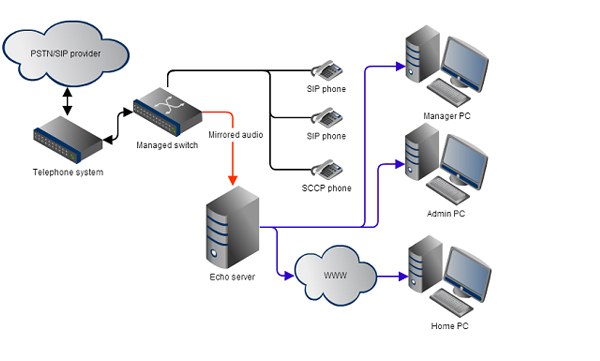 Echo intercepts both ISDN lines and VoIP network traffic so any phone calls are merged into the normal call records of the TIM Plus or TIM Enterprise call logger to which it is installed. The recording will be attached as just another property of the logged call. For VoIP (SIP) channels, a PC with a standard network interface card (NIC) can be used to capture the voice packets from strategic points in your voice network. 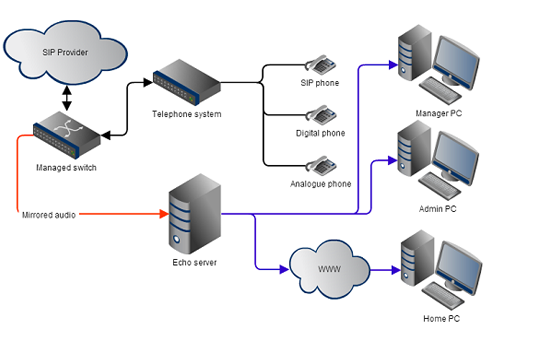 If many simultaneous VoIP calls are expected, a dedicated computer with multiple NICs becomes necessary. To record calls over PSTN, channels such as ISDN30 (PRI/E1/T1/J1), ISDN2 (BRI) or analogue POTS lines, a physical hardware device is used to intercept your lines, such as a USB box or a PCI card, depending on your deployment needs. All calls are securely encrypted using an industry standard 256-bit key AES algorithm. If you're in the process of migrating from ISDN to SIP, we can support both in a single solution. You can even add ISDN2 and analogue into the mix. If you use PRI, BRI or Analogue lines, this will include one or more of our Echo hardware devices. For SIP recording, no additional hardware is required. However, in order to collect audio information it must be installed on a computer that has an additional network card connected to a mirrored port on a local managed network switch. In order to determine the specific add-ons required to add the recording option, you'll need to determine the number of sites and the type of lines on each. e.g. Our software-only VOIP recorder, Echo, complements the TIM plus and TIM Enterprise solutions, providing call recording integration for both SIP and SCCP (Cisco Skinny) calls. 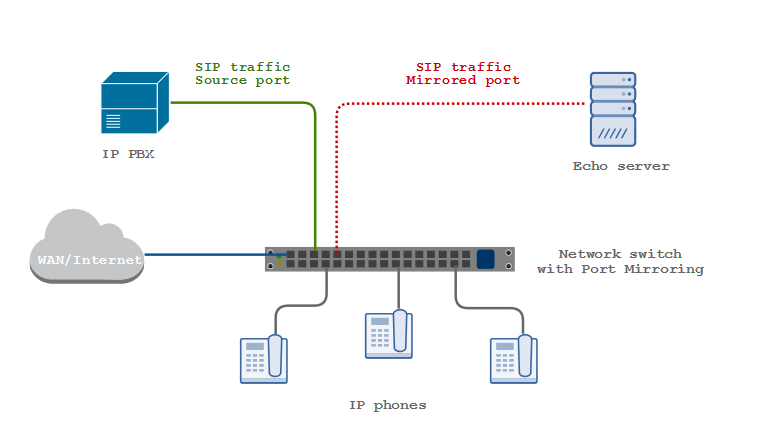 The call recording of SIP lines requires a port mirroring setup, which enables the monitoring of network packets. The port mirroring allows the SIP traffic going through one port on your managed switch to be copied to another port for packet analysis. TIM Plus and TIM Enterprise will then benefit from the same "click-to-play" call recording integration as that provided by our ISDN and analogue hardware taps. The image below illustrates the general configuration involved in port mirroring. Echo supports VOIP traffic that uses the G711 codec - either a-law or mu-law, and has an exceptionally-high compression rate with virtually no loss in quality, storing an average 3 minute call in less than 350KB! Zero-configuration STUN port reconciliation is automatic, so placing your mirror in any reasonable part of the network is supported. The primary network card would have its IP configuration setup so it is visible on the data LAN. This allows playback of recordings by authorised users of the system, as well as remote control (such as Remote Desktop) of the Echo server if required. The secondary network card would have its IP configuration setup so it is visible on the SIP/telephone network. This will allow it to have mirrored traffic sent to it for monitoring and recording by the Echo server. Industry standard AES 256-bit symmetric key encryption is built-in as standard, and call obfuscation (masking sensitive parts of a call) is possible by either DTMF digit entry or through our API to integrate with your own systems. Echo is fairly priced, governed simply by the number of concurrent VOIP conversations it sees. The example below shows the network layout for an installation that would allow recording of external calls across SIP trunks. Monitoring the trunks allows any phone system or handsets to be recorded. This includes proprietary handsets which would normally be expensive to record extension-side. The managed switch needs to be configured to mirror the port where the telephone system would be sending the SIP/RTP call information. The diagram below shows an example of network layout for an installation that would allow recording of internal (depending on configuration) and external calls across the telephone network. Monitoring handsets that are capable of either SCCP or SIP communication allows generic recording to occur no matter what combination of PSTN interfaces are in use (e.g. SIP, PRI, BRI, analogue). There are two ways the monitoring can be configured for recording extension side audio. The first method will record external calls only, whereas the second will record all calls but will add further load to the managed switch. All calls: The managed switch needs to be configured to mirror every port that has a telephone connected to it, but the telephone systems network connection does not need to be mirrored. The second method allows the collection of the internal RTP traffic that would not be seen at the telephone systems network connection. For this type of telephone line, you'll need to add hardware. The choice of card or unit deployed will be determined by the size and complexity of your system. For sites with analogue (POTS), BRI and smaller PRI sites, this is typically a USB Box or PCI card. For sites with a larger channel count, we supply the HyperArray voice recording units. These hardware devices passively intercept your phone lines, monitoring and recording all calls that pass along your lines. The different types available allow you cover all line combinations including PRI (T1/E1), BRI and Analogue. For more information on all hardware devices, just click on the hardware tab alongside. D-channel signalling supports Call Setup, Connect, Clear, DDI number and CLI number decoding. It also supports all major ISDN variants, Q.SIG, DASS-2, DPNSS and various PBX digital handset D-channel protocols. Simultaneous recording on all channels of both upstream and downstream sides of a conversation is catered for. The Echo USB Voice Recording devices is suitable for small to medium channel count and can be attached to any telephone system connected to one of our call logging solution, TIM Plus or TIM Enterprise. The USB box will be connected to the PC running the Echo software, where the audio files will be stored and embedded thereafter in the call logging software. The Echo PCI Voice Recording boards are designed for medium to large organisation. Each card only occupies a single standard 5V PCI slot and combines a compact form factor with very low power consumption. The Echo Array is a very high density voice packetizer for building large scale PRI/E1 based TDM voice recording systems.